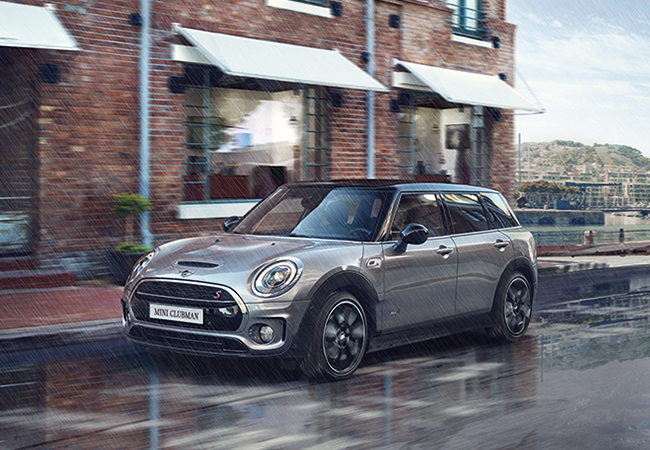 No matter what weather or driving conditions you encounter with MINI’s ALL4 All-Wheel Drive, the pure motoring fun you expect from a MINI remain the same. ALL4 is MINI’s dynamic four wheel drive system which can be found in the MINI Countryman and MINI Clubman. This system provides sure footed traction, maintaining MINI’s world-renowned agility on every journey you take. So you can enjoy your MINI to the fullest! How does ALL4 separate itself from other all-wheel drive systems? When a loss of traction is detected on a wet surface, the system redistributes power as needed between the front and rear axles—combined with the standard Electronic Brakeforce Distribution, control is maximized. On slick winter roads, ALL4 distributes power between the front and rear axles as required. Combined with the standard Cornering Brake Control, this optimizes traction and directional stability. The ALL4 Dynamic Stability Control system calculates the ideal traction distribution required to optimize control and enhance agility on rugged terrain. Even when road conditions are perfect, MINI’s ALL4 All-Wheel Drive system is always working to efficiently transfer power to enhance acceleration and stability on straightaways or through every curve. No matter a MINI Countryman or MINI Clubman, they both make for the perfect ride suitable for any weather, all year round. Not convinced yet? Book a test drive and feel it for yourself. What is a MINI John Cooper Works?